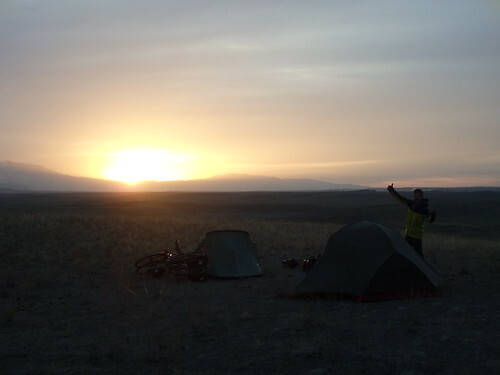 From Kyrgyztan’s capital Bishkek it was only a 25km ride to the border. 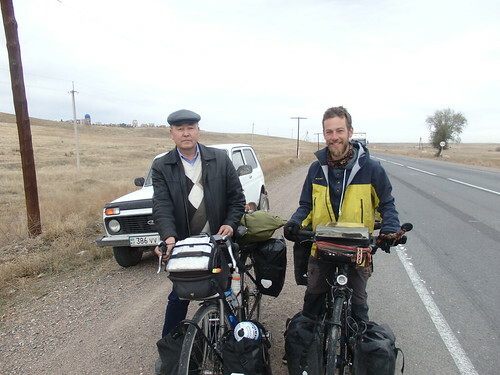 I met up with the Frenchman Bertrand (who I’d cycled with in Tajikistan) and we headed over to Kazakhstan together. The border was a total shambles. 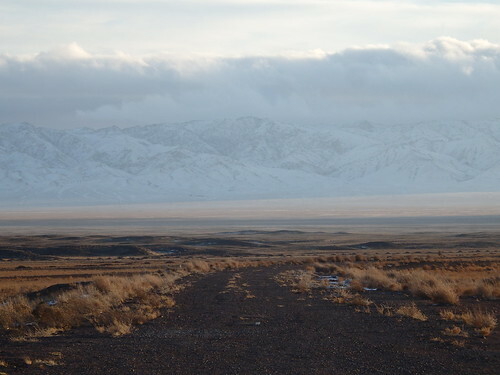 I’ve come to expect nothing less from Central Asia’s border crossings, but the last couple I’ve passed have been remote and quite. 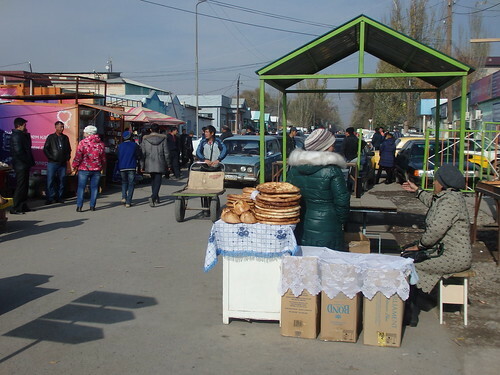 This was the opposite – a connecting point between two huge cities (Bishkek & Almaty) and chock-a-block with people shoving their way through wheeling massive carts of goods. Why can’t they learn to queue!? 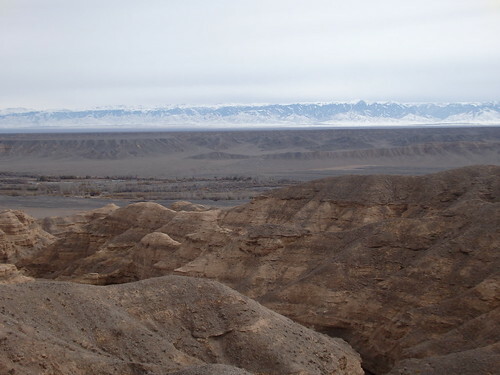 Just like Kyrgyzstan, Kazakhstan also offers visa-free entry to most Western nationalities. I’d forgotten to check the most part of that. I was talking to a Canadian the evening before I was planning to cross who told me that he wasn’t eligible to enter visa-free. 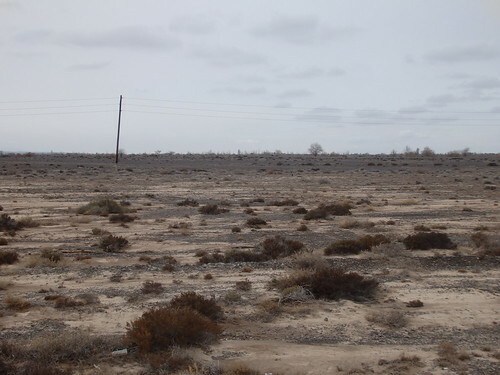 I was just going to show my Danish passport at the border but that would have been a little awkward – Danes need a visa to travel in Kazakhstan but Brits get 15 days free. Good thing I checked! I switched passports and now I’m English once again. 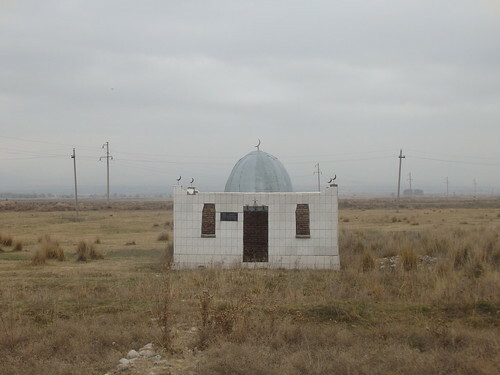 Kazakhstan is the richest and most developed of the ‘Stans’. 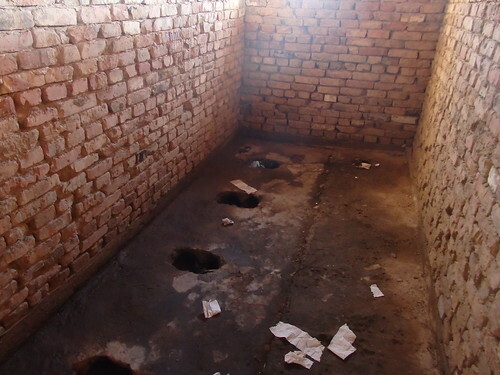 Can’t they invest some of that oil money into making proper toilets? Bertrand posing with a local bloke who wanted to take our photo from every angle under the sun. After a strange 10 minute photo-shoot we escaped as quick as we could. Three big dogs came charging out of nowhere straight towards us. I handled the situation like I always do – braking sharply and shouting at them but I’d forgotten Bertrand was right behind me! He was watching the dogs sprinting towards us whilst pedaling away from them so he slammed into the back of me. I fell off and heard a loud slam from the road as I did. Confused about what had just happened I quickly got up and saw a van and car stopped in the middle of the road. They slowly drove away revealing the victim of the thud – one of the dogs lying crippled on the ground. It could barely get up, limping slowly to its feet and then falling again. There’s something about bicycles that just sends dogs crazy. When they come to chase me they think about nothing else and for months I’ve been wondering (/secretly hoping) when one will be hit by a car. 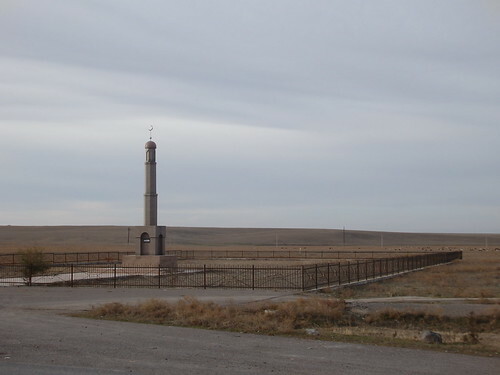 The country is littered with random statues/monuments that are usually in the strangest places just next to the road. A woman came out from the house where the dogs had been. I wasn’t sure what her reaction would be at seeing one of her dogs half dead on the road. She picked up some stones and started throwing them at the poor animal! 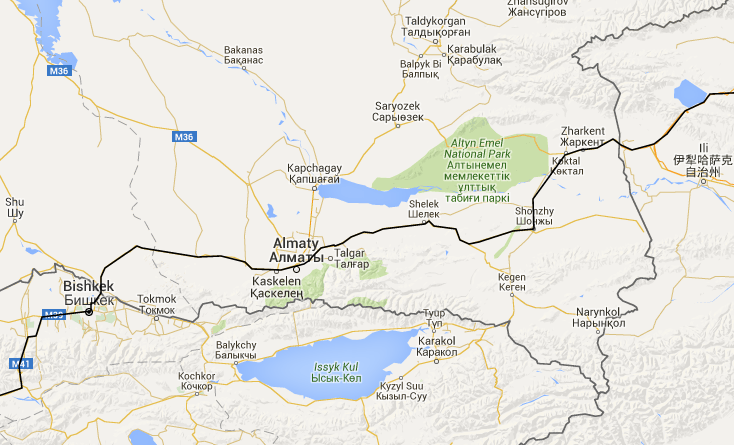 After a couple of days we reached Almaty, Kazakhstan’s old capital. It was the most developed place I’ve seen in Central Asia and the most European city I’ve been in since Armenia’s capital Yerevan many months ago. Fancy oil-bought white SUVs bombed around the city while suave young Kazakhs and Russians strutted along a backdrop of fancy cafes. It was a million miles away from the world of Borat (much to my disappointment, I must confess). 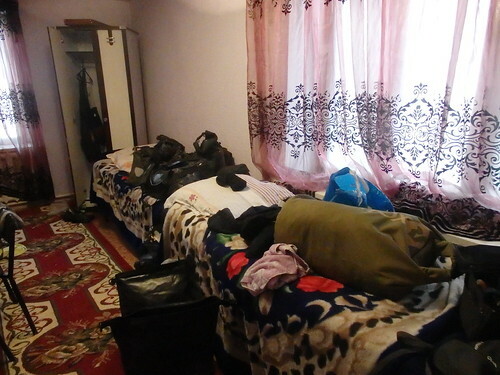 I had an errand to run in Almaty: my camera had broken again and I needed to find someone to fix it. 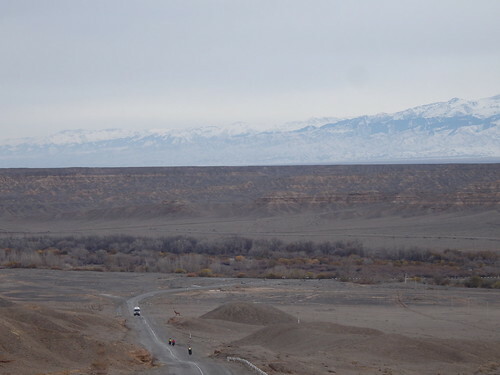 That ended up being quite the challenge – finding a camera repair shop in a big Central Asian city is easier said than done. I ended up cycling around the city for two days until I found someone who could help me. I’m going to make an unfair generalisation now, so apologies in advance. For the same reason I didn’t enjoy shopping in Bishkek, I didn’t enjoy this shopping hunt in Almaty thanks to the miserable Russians who refused to help me. I’d collect a list of addresses, cycle across town to one of them – typically an electric repair-type place down a dingy alleyway under the dregs of Soviet tower blocks only to find a horribly unhelpful person who’d just look at me and say ‘nyet’ without even getting out of their chair. In Tehran, Iran (where I last needed to fix it) they personally called up every person in town until they found someone to help me, but here? The total oppoisite. The lack of customer service was crazy. I guess I wasn’t an actual ‘customer’, but how about just a bit of human helpfulness? Man it was frustraing. When I collected my camera the repair guy had left this test photo on it. I can’t read Russian but it looks a lot like a dating website? Eventually I found a fix for it thanks to a couple of young Kazakh guys with translator apps on their phones. I’m not too happy with this camera though – it cost me £150 new, but now these two repairs have cost me almost £50. Not impressed! 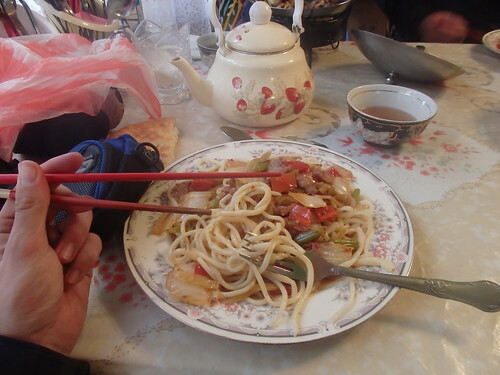 The Central Asian staple ‘laghman’, but this time something new – chopsticks at the table! So far in the ‘Stans’ it’s just been forks and spoons (knives don’t exist in this part of the world which is fine until you encounter one of the many dishes that require cutting). Welcome to the Orient! 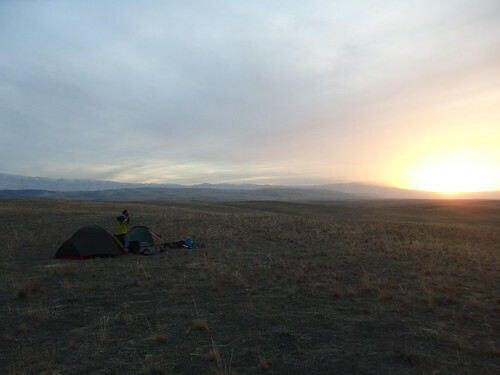 We met up with Aussie couple Sarah & Scott who I’d met in Kyrgyzstan. They’ve cycled here from Scotland (you can follow their travels visa their page Long Rode Home). 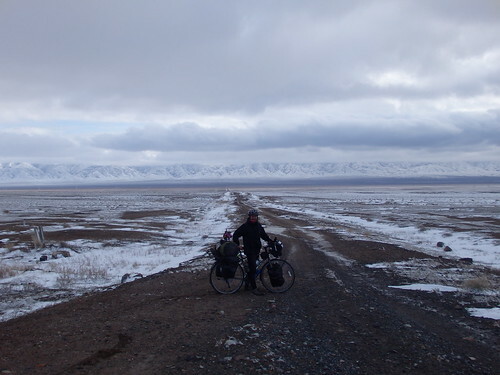 They were also heading for China so along with myself and Bertrand we headed off as a foursome – the biggest group I’ve ever cycled with. 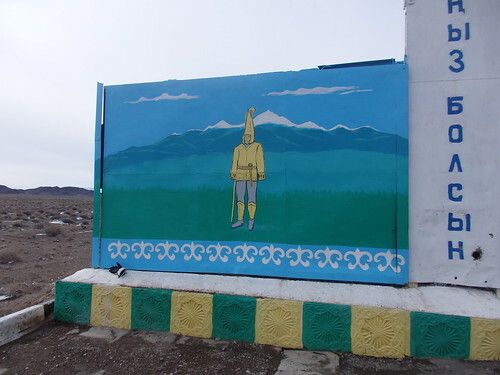 Typically quaint Kazakh decor. I love it. I was worried that it would be too slow cycling as a large group, but actually the pace was fine and the company was brilliant. I wasn’t in a huge rush just yet. I’m pushing to try and avoid the worst of winter in China but actually I only really need to put my foot down once I’ve crossed the border. I have a new mascot with me as of Bishkek. Allow me to introduce Fred the Camel aka The Silk Road Sessioner. 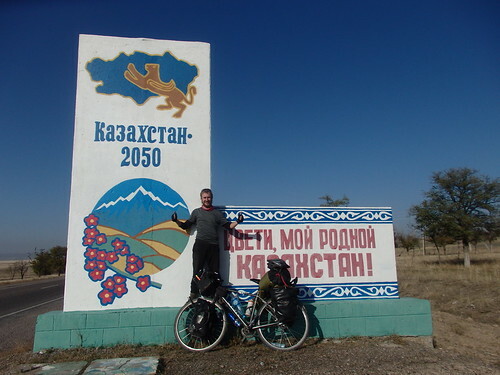 China was a huge milestone for each of us but we still had a few hundred km to cycle across the steppes of Kazakhstan. The country felt a little different to the other ‘stans’ somehow. It seemed more ‘Russified’ (is that a word?) to me but that might just be because their were so many Russians around! 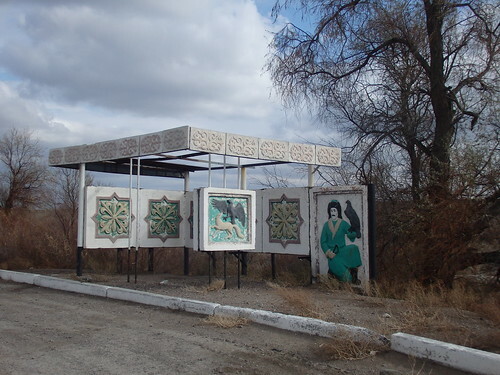 On the reverse of that monument was a typically awful Kazakh painting. 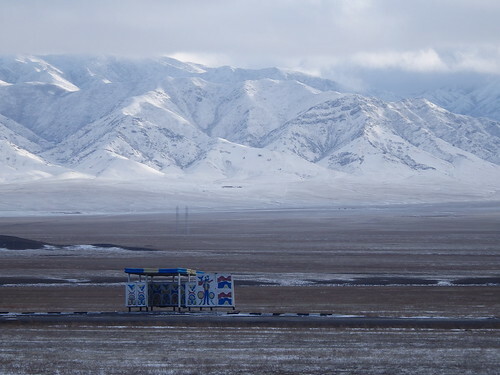 Those warm couple of days we had between Bishkek and Almaty were apparently just a blip and all the locals were back in their big puffy coats and fur hats. The villages are lined with trees but barely any of them have any leaves left on them and those that are still dangling have autumn shades written all over them. 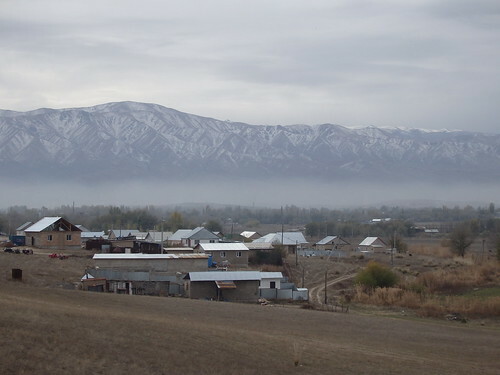 The rows of wonky grey houses help make the country feel bleak and uninviting – yet somehow that Central Asian charm is still seductive. When you open your tent door to see this you know it’s not going to be an easy day! I was about to wish I had one of those fur hats myself. The second night we dived into our tents just as the rain began to fall. 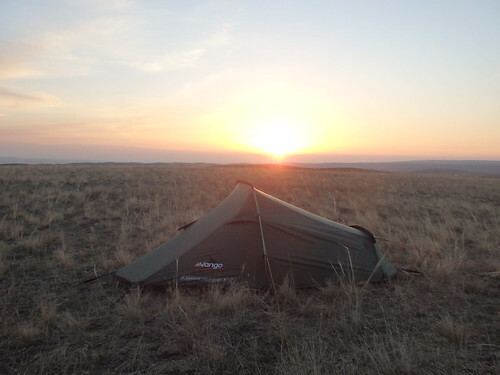 When I woke up my tent roof had sagged so low it was almost on top of me – I couldn’t see beyond my thighs. I sat up and my head brushed something hard outside my tent. I poked the upper wall. 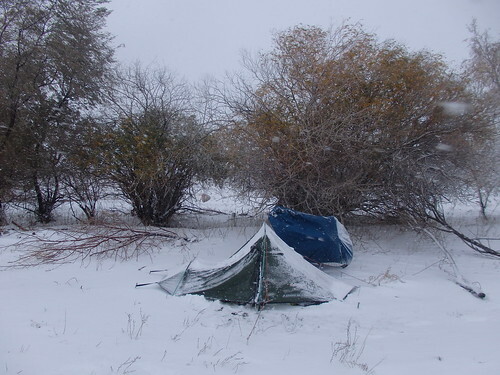 Either something had landed on my tent or it had snowed a lot. I peered out my front door. Jesus – it was a blizzard outside! I was dying for a wee and so had to crawl out in all my clothes. Traumatized by that brief excursion I slipped back into my sleeping bag and we all spent the morning yelling profanities to each other about how there was no way we could leave in this snow storm. It definitely didn’t look like this when we pitched! My useless tent had leaked a swimming pool by my feet which I’d mopped up with my spare sleeping bag but by the time we finally left everything (including myself) was a soggy mess. 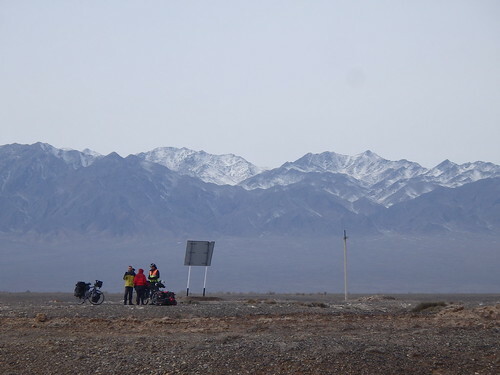 We cycled as quick as we could up the mountain until the next cafe where we threw all our clothes on the radiator and drank jug after jug of tea. Some soldiers came in sat at the table next to us. Just as I was whispering to Scott ‘is it too inappropriate to ask them for a photo?’ they gave us a photo mime and beckoned us over. 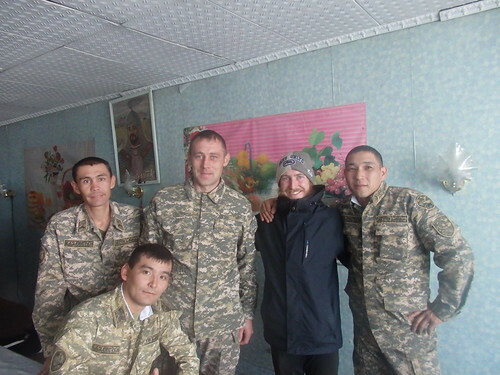 They put down their beers (it’s Kazakhstan – you don’t question the army drinking during their midday break) and we all posed for a nice photo together. One of them gave me a note of Tenge (Kazakh money) which I think was an old and out-dated note. He said ‘souvenir’. I gave him a ripped up note from Iran which they all got very excited about. The only good thing about the cold is that I can finally carry chocolate again without it melting in my bag. 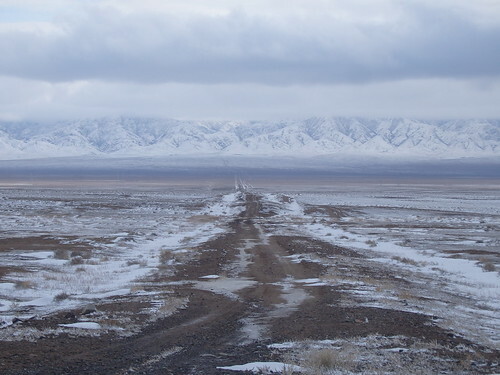 Kazakhstan – cold but beautiful! We continued climbing and reached a high plateau. We’d hoped to find somewhere warm to sleep after yesterday but there was nothing around. 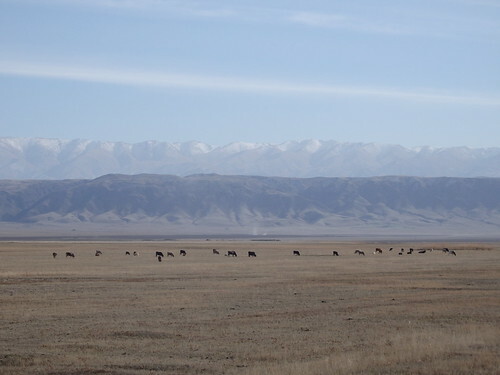 Just wide open steppe. 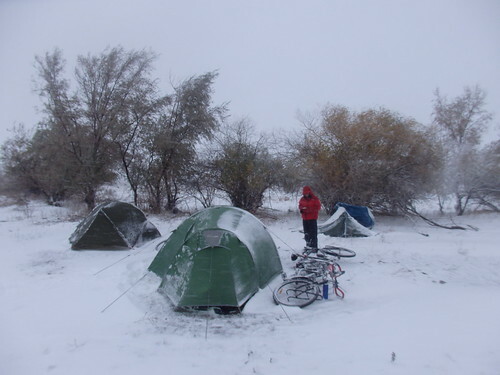 We pitched camp and hoped the night wouldn’t deliver anymore snow. It didn’t, but it was bloody cold. Everything had frozen over as the temperature plummeted way below zero. When I say everything, I mean everything. Even things I didn’t think could freeze: my wet wipes, the residues of pasta sauce in my pot and my toothpaste. The ice claimed its first victim – my water bottle! 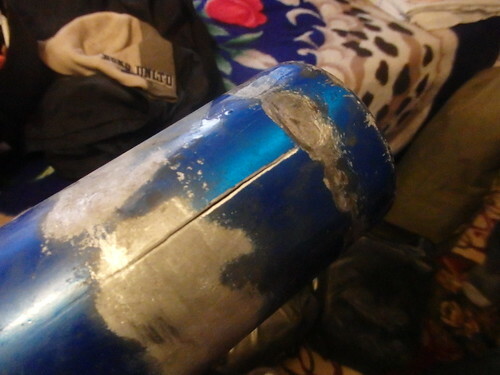 Fortunately it was just a cheap old thing (a fake Adidas flask that cost £2 in Iran). The water froze, expanded and split the thing open! 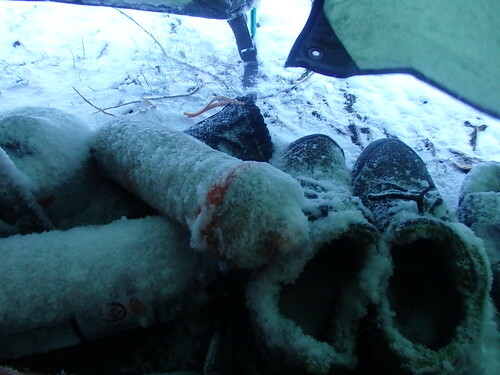 Our bottles of water had frozen over inside our tent so we had to melt snow for breakfast. 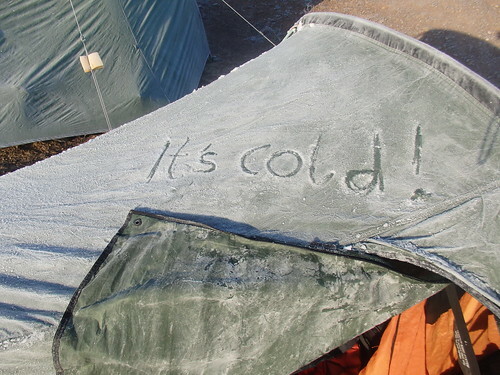 I clearly have some learning to do if I’m going to stay comfortable camping in such cold. The next problem was the bikes. 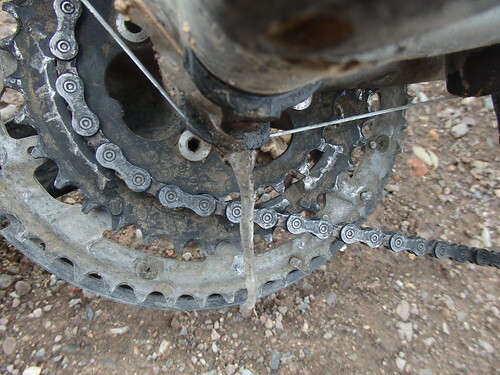 The snow from yesterday had gotten water all over our bikes and the frozen left-overs had clogged up all our gears and brakes. We had to heat up water just to loosen the frozen parts enough to get moving. 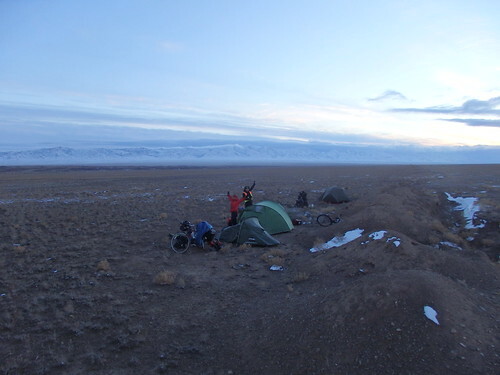 We quickly discovered that peeing on the ice was a quicker solution to get the bikes working than boiling water. Is this what it has come to? Weeing on our own bicycles!? Finally we were one the move again. 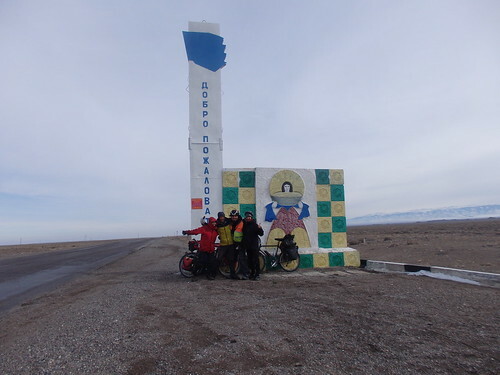 We followed the road in a dead-straight line for another 50km before reaching a small town. It was time for a hotel. Apparently none of us were ‘hotel type’ people – that was pretty evident as none of us knew the local sign for hotel. We followed people’s pointing to the corner of town where there were apparently three guesthouses but still couldn’t figure out which door to knock on. Eventually a girl marched us to the exact place and we got a room for the four of us for £10. We were back in the desert. The road was a long straight line with very little to entertain us along the way. 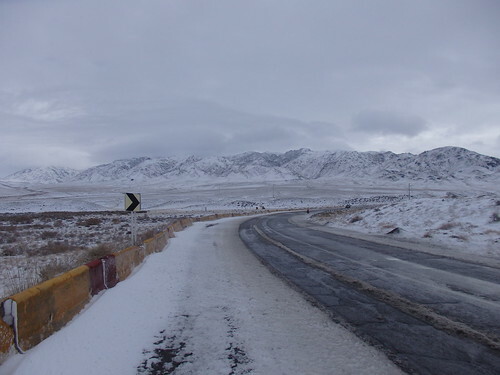 The monotonous road was only broken up by a large section of roadworks where we were deviated onto a dirt track while the main road was converted into a monster four-lane motorway. This is part of the international ‘super highway’ plan that will connect Western China with Western Europe. 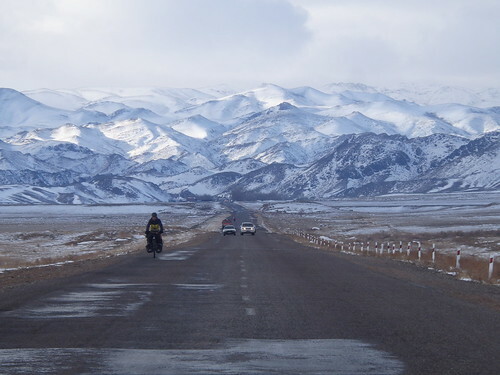 Apparently China finished their part of the deal years ago (a neat motorway starts at their side of the border) and now the Kazakhs are finally getting around to it. The only other points of interest are, would you believe it, the bus stops. 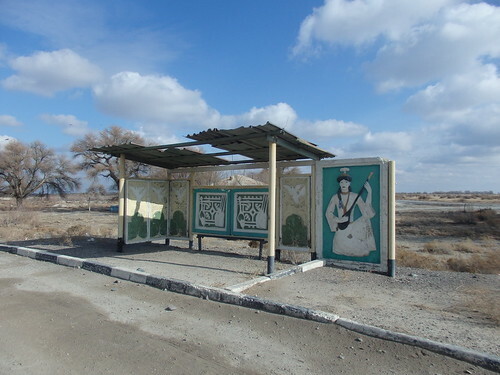 I’ve always liked the artistic bus stops in former Soviet Union states (I’ve included pics of them before in my blog) but in Kazakhstan they are the best – hands down. Miles from the nearest village. I wonder if anyone has ever caught a bus there? Another overgrown bus stop, this time with a very trendy mustached man and his hawk. We pulled into our last Central Asian town after a long day and stopped at the first hotel (pretty easy now we actually knew the letters to look for). It was cheap like the other place, about £2.50 each, but really seedy. There was a big ‘nightclub’ sign on the front door and a very suspect woman walking around caked in make-up with a short red dress on and long black leather boots. I was kept up at night listening to the rats scampering around in the roof. Happy to be out of the tents! 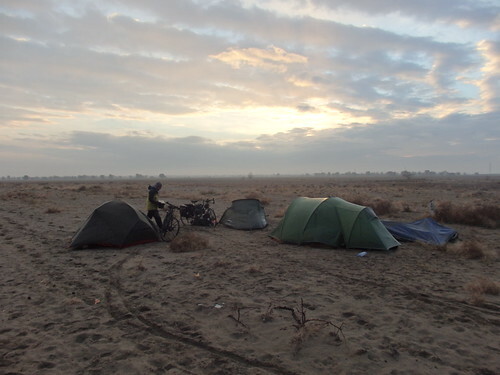 We rode towards the border and camped in the desert so that we could head into China in the morning. 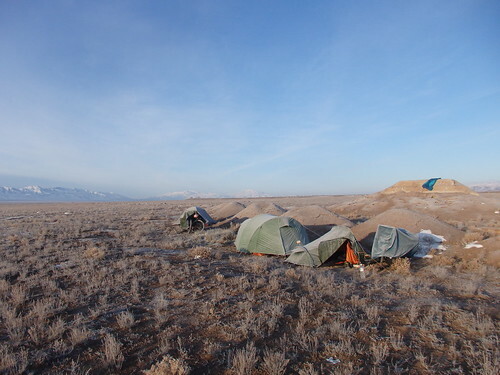 A fitting last campsite for the Central Asian adventure – out in the desert once again. I handed him my Danish passport and showed him the Chinese visa in it. I haven’t done anything wrong, but the countries that don’t recognise dual citizenship normally get a bit confused about it. I never know what they’ll say when one of the passports requires a visa for entry into their country (like my Danish one). He looked unimpressed. ‘Wait’. My documents were put aside and he stamped everyone else out while I had to wait for 20 minutes. While we waited for God-knows-what he asked Sarah ‘husband?’ pointing at Scott. Then he turned to me and asked ‘husband?’ and then started laughing at his own joke. I decided against asking him ttheeh same thing in return. Great. The border guard isn’t letting me out the country and now he’s teasing me about being gay! Eventually the big boss turned up and was shown my two passports and the stamps inside. I didn’t understand what was being said but it was pretty obviously something along the lines of: ‘don’t be a plonker mate. He’s here visa free. Give him the stamp and don’t waste my time’. The first guy looked embarrassed, gave me the stamp and released me from Kazakhstan. 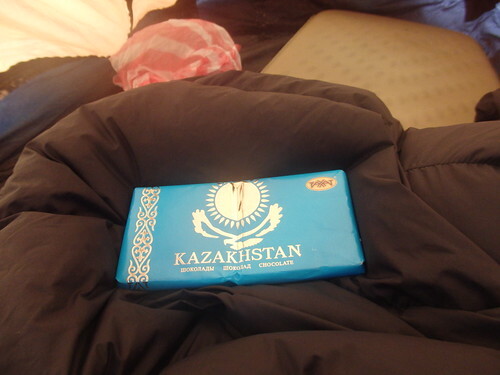 And with that my adventure through the ‘Stans’ of Central Asia came to its conclusion. I’ve loved it. I’ve never traveled a part of the world that’s been so exciting. It’s been crazy at times, frustrating yes but completely rewarding. Beautiful landscapes, wonderful people, a couple bites of nice food and a colourful melting pot of cultures. But now it is time to tackle the monster that is China! 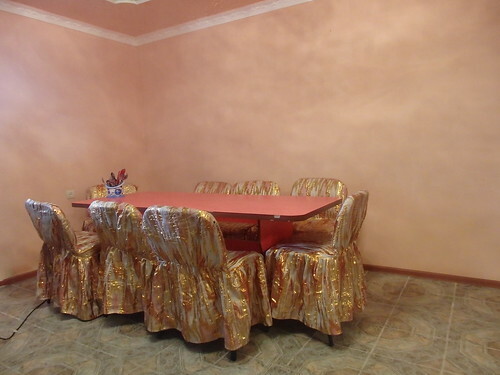 I think you will find the ‘Typically quaint Kazakh deco’ are left overs from the Soyuz space program. 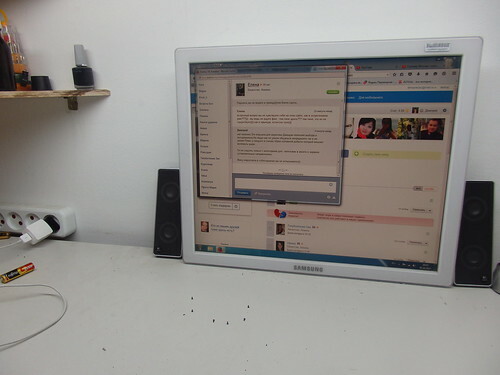 Loving the blog. Keep pedalling. 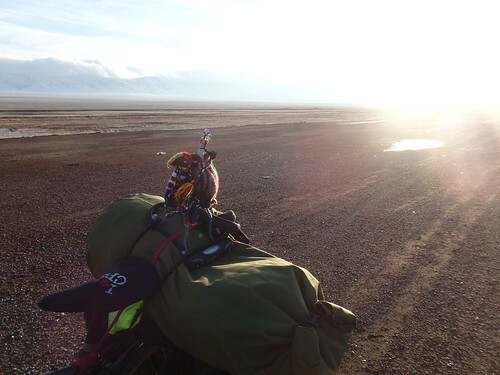 Peeing over your bike to defrost is better than finding yourself frozen in your tent in the morning after a night on the beer & not having a container to pee in!! Believe me I know.